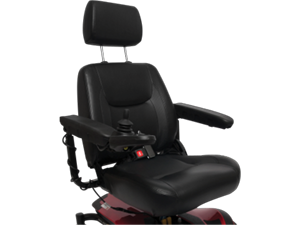 You should always make sure that the brake is set when your wheelchair is in a stationary position. And, when you’re either applying or releasing the brake, you should use your other hand to hold onto something for stability. When it’s possible, you should push the wheelchair, instead of pulling. Pulling may exert too much force, which might cause the person sitting in the wheelchair to fall off. Whenever you’re going over small bumps or transitioning between floors, apply downward force on the back of your wheelchair to reduce pressure on your front. It’s also a good idea to repair any damaged flooring, if possible, to improve your mobility. Your feet should be on the footrests to stop any dragging or potential injuries, which will also make it easier for your caretaker to move the wheelchair. Don’t hang any heavy bags or objects on the back of your wheelchair because this can make your wheelchair to become unbalanced and/or tilt backward. There is a higher chance of this occurring for smaller people and children in wheelchairs. You should be extra careful going down slopes and ramps. Always back down slowly and never hold the wheelchair from the front. It’s important that you always make sure you have a clear path without any obstructions for your wheelchair. Ask your friends and family to help you maintain your wheelchair, which includes tire maintenance and cleaning the wheel bearings and spokes. They should be more than willing to help you out and this will lessen the things you need to do for your wheelchair. It’s also a good idea to have a Casbar handle for your wheelchair, which retrofits to wheelchairs with a handle width measurement of either 16” or 20”. This will make pushing your wheelchair a lot easier. Having to manage a wheelchair needs a lot of work from you and your caretaker. However, if you incorporate these easy and helpful wheelchair handling tips into your daily routine, you’ll be able to improve your wheelchair safety in the long run.